Religion has become associated with having a focus on morality. But that wasn’t always the case, researchers say. Academics have long suspected that the modern world’s major religions were born of major spiritual movements which emerged in Eurasia about 2,500 years ago due to a population boom, and a subsequent need to create a moral order out of what could have been chaos in increasingly large communities. However, a recent study challenges that theory, proposing that ancient affluence and rising standards of living spurred the rise of morality religions. Is this a case of ‘more money, more morals’? Lead author of the study published in science journal Current Biology, Nicolas Baumard, research scientist at École Normale Supérieure in Paris believes that the philosophies of today’s major religions — Buddhism, Islam, Hinduism, Judaism and Christianity—originally arose because populations in the great civilizations in Eurasia increasingly had access to energy, free time, and wealth. “The authors investigated variables relating to political complexity and living standards. Affluence emerged as a major force in the rise of moral religion, in particular, access to energy. Across cultures moral religions abruptly emerged when members of a population could reliably source 20,000 calories of energy a day, including food (for humans and livestock), fuel and raw materials,” reports Scientific American. The researchers propose that the newfound access to steadily procured food and fuel, and not having to worry about immediate problems such as shelter or predators allowed the people of early civilizations to relax and turn thoughts to the purpose of life, the afterlife, and moral responsibilities. When energy was bountiful populations had to compete less with neighbors, cooperated more, and more importantly, started to consider long-term strategies over short-term gains. Baumard explains that although religion today is often associated with self-discipline, morality, asceticism, moderation and compassion, spirituality of the ancient past wasn’t necessarily invested in such concepts. Early hunter-gatherer societies had spiritual traditions which focused on ritual, sacrifices, offerings, taboos, and protection from evil or misfortune. 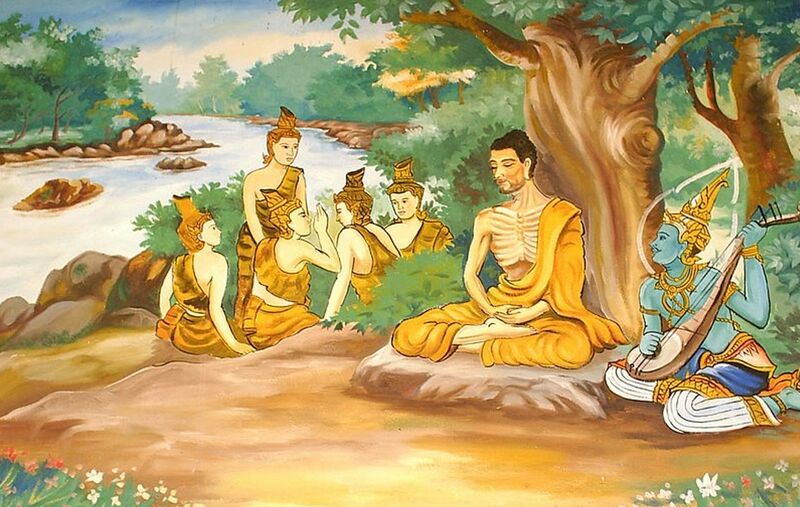 All that shifted between 500 BC and 300 BC in the “Axial Age”, when new beliefs and a cultural convergence almost simultaneously arose in different places in Eurasia from in Greece, India, and China in the form of Stoicism, Jainism, and Buddhism. The self-denial was thought to be a means of attaining a higher spiritual understanding or existence. Simply put, “You need to have more in order to be able to want to have less,” Baumard says. 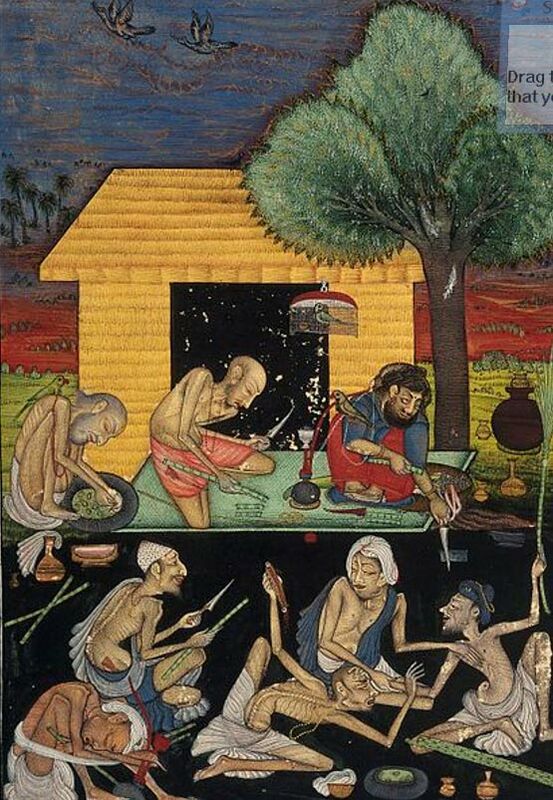 Ascetics preparing and smoking opium outside a rural dwelling in India. Gouache painting by a follower of Chokha, ca. 1810. The team also acknowledges that morals are independent of religions, and may have been a part of the human condition long before the major religions focused on them. Sikh ascetics misbehaving: preparing drugs, slothfulness, begging, teaching the young wrong ways. Colored transfer lithograph. Indeed, others have challenged the study findings. Edward Slingerland, historian of religion in ancient China at the University of British Columbia believes that the research has merit, but the concepts are outdated. Religion scholars now doubt the Axial Age timeline. He says, “In early China, a lot of the moralizing stuff is arguably earlier than that,” according to the journal Science. Slingerland instead thinks that belief in a moral god and a practice of morality smooths interactions with strangers who need to cooperate as societies grow and become more complex. Is the line drawn between affluence or energy and moralistic religions a correlation only, and not a cause? In an article written on this subject by Yale psychology graduate student Konika Banerjee and psychology professor Paul Bloom, the pattern seemingly flips after time. It seems to be that trend has certainly reversed in this day and age. Case in point: the vatican; one of the wealthiest institutions on the planet and relatively zero morals. Nothing has been done about the pedohpilia scandal, nothing has been done about the Canadian aboriginal genocide, nothing has been done about the Palestinian genocide. Duping people with false promises is the hallmark of organized religion these days. The Catholic Church did deal with the pedophilia scandal. In addition to millions of dollars being paid out in settlements, all the Catholic priests who were involved in this were forced to undergo psychiatric treatment. I addition, most of the priests were transferred to places where they had no contact with minors. I fail to see what else the Church could have done. As for the Canadian aboriginal genocide and the ongoing persecution of Palestinians, those, like almost every genocide in history, are the doing of the governments of their respective countries. The Canadian government bears responsibility for the aboriginal genocide. The government of Israel is at fault for the abuse of the Palestinians. The Catholic church had nothing to do with those. In fact, the popes have often criticized the Israeli government for its mistreatment of the Palestinians, and the current pope, Francis, led the Vatican to recognize the Palestinian state. This study seems very shallow and ignores prior religions. The Axial Age, a term coined by the German scholar Karl Jaspes, showed a major shift in religions, from concerns about what some religious scholars call “Cosmic Maintenance,” or keeping the planets and earth in good order so they don’t kill people, to religions that focus on the self and personal salvation. Why did this happen? This article says because of increasing wealth, but if so, why did the people not have more wealth before? What changed? Did they get new technology? Not that we know of? Did they get new crops? Not that we know of. In fact, mainstream approaches to the past have no answer for this major shift in attitudes. Why did the people before about 700 BCE fear the planets such as Mars? Why did Roman society, which came into being around 700 to 750 BCE, worship Mars and have major religious days for Mars? I think the world encounter a series of disasters from space, that covered a very long period of time. We have lots of evidence of disasters from space, but mainstream science buts them all “far, far away and long ago.” Nothing in human experience. But I think human experience for at least the last 100,000 years has involved massive disasters from space and that it has caused enormous harm to our species and many other species. I think we all have devolved as the mutated ancestors of a prior, more intelligence species and that we have no fossils of this species because it lived in tropical forests, which mostly disappeared during the catastrophes. A lot of scientific data backs up these thoughts. Geneticists tell us humans had a bottleneck event not so long ago, or a time when almost all humans died out and the survivors had to interbreed to continue the race. Evidence of strikes from the sky exist everywhere. On June 30, 2015, the first Asteroid Day will try to bring world attention to the enormous dangers from space. While the increased wealth and free time matters, it is the need to control the masses that brings the new religions about. Religion has always been about power, control and money. Morality in general is innate in many animals, they behave compassionately, humans are amazing in their ability to feel empathy and think about how they would feel in situations. Once absolute survival was no longer on the line they rose to greater heights. Religion however is not the epitome of that height. Religion is the elite and powerful fighting for control of the wealth and resources.